Jesse is now about 7 months old, healed from his broken leg, and ready for adoption! He is using his leg about 25% of the time. The doctor says he will rehab himself and that is exactly what he is doing. Jesse is a very wiggly fun little guy, who loves to cuddle and doesn't know anything about personal space. He weighs about 30 pounds now but, being more of the tall and lean type, my guess is when he's full grown he will be about 40 pounds. Will you be the one to help Jesse get a home from Santa this year? Jesse's pin is out and he is on the mend! The doctor says it will take some time before he will have full use of that leg. He does use it every once in awhile to scratch his head or to balance. I have to say it doesn't slow him down. He is a high energy little guy, and is always ready to go, but is not hyper and does have an off button. I think Jesse would be best placed with another young dog, as he LOVES to play and cuddle with other dogs. He's also very tuned in to his person. He travels in the car perfectly and enjoys going places. Jesse is a really happy boy with no baggage! 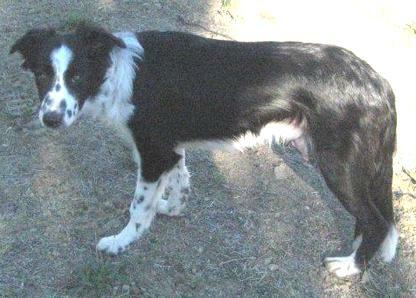 Meet Jesse, a 5-month-old Border Collie who entered the Orange County Animal Shelter on Sept. 24 with a broken leg. We learned about him on September 29th and had him out of the shelter on September 30th. Jesse was then scheduled for surgery on October 5th. The vet said Jesse's break was probably around 3-4 weeks old but expects him to make a full recovery. 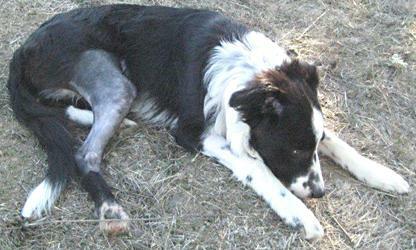 Jesse had a long pin put in his leg for support, and the pin will come out after six weeks. We owe a special thanks to Danna Ruscha and Pnina Gerston of Lifeline 4 Paws who helped us find funds for Jesse's surgery. Danna and Pnina secured a $1,000 donation from the Hogan Foundation for his procedure. Thank you so much, Danna and Pnina! Additionally, BCIN wholeheartedly thanks the donors who supported our fundraising efforts for the Best Friends sponsored Strut Your Mutt on 19 September. We strutted for our latest medical needs pups, Ferris and Angel...now Jesse is also a recipient of your generosity. BCIN has taken in many medical needs dogs in 2010, and we are so thankful that we have not had to turn away any dog due to lack of availability of funds for their medical care. These 3 pups were slated for euthanasia and they would have never made it out of the shelter without BCIN's help. These pups now have the opportunity of fully living their lives in their future forever homes. As is typical with a puppy, Jesse is working on his potty training and is learning quickly. He doesn't bark and has been doing fine with his crate training. He is adventurous, likes water and corrects easily. Despite his current condition, Jesse doesn't take any bullying from his foster siblings (but he does get along with them), so we think he runs as a mid-to-upper level male in his pack. We should know even more about him after he is fully healed and off the doctor-prescribed meds. Jesse is as sweet as it gets and has his foster mom completely in love. If you are looking for a keeper, Jesse is the one for you.